Levi Springer & Cornelia Goucher Northrup Kierstead Family, probably 1900 – commemorating their arrival in Massachusetts from New Brunswick. Hans Kierstede (1612-1666) is claimed to be the first of that name to come to the New World, New Amsterdam to be specific, which is now New York City. He is said to have survived the infamous massacre of Magdeburg in Prussian Saxony, and all Keirstead, Kierstead (and variant) families in North America are said to be his descendants. The family above is that of my great-grand parents, Levi Springer Keirstead (1858-1921) and Phebe Cornelia (Goucher) Northrup (1859-1941) in Littleton or Groton, Massachusetts where many New Brunswick Keirsteads lived on return to the country of their ancestors. They were Baptists and hard workers; Levi farmed and was laboring in the textile mills the year before he died. Cornelia first married Seth Northup in 1882, who died in 1889, leaving five children behind. 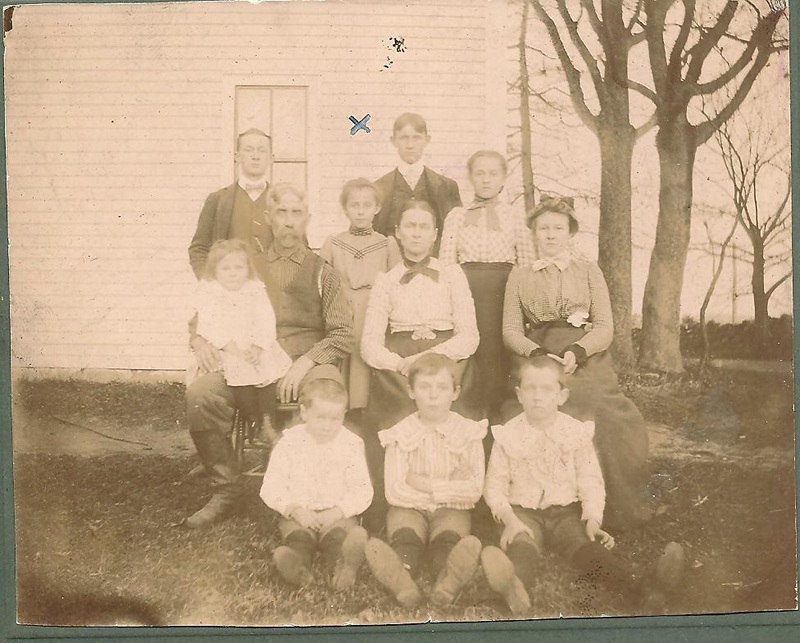 Levi, a bachelor on the neighboring farm, married the widow in 1891 and took on four stepchildren. The couple had seven children together.